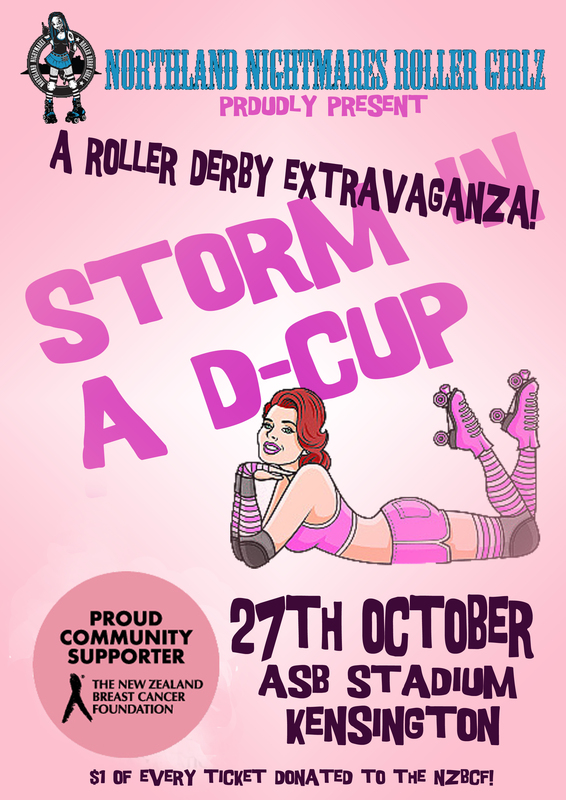 Northland Nightmares Roller Girlz are very proud to present Storm in a D Cup, our final event for the 2012 Season! This event on the 27th of October is raising money for The New Zealand Breast Cancer Foundation and we will be going all out in various shades of pink to make sure this is a day to remember! We’re hoping to have three bouts: Northland Nightmares Derby Bratz, a Fresh Meat bout and the main event will feature our advanced players, plus special guests from Mount Militia Derby Crew, Port City Rollers and HBC Rollers! Watch this space for more details or check out our Facebook page closer to the date. This entry was posted on September 22, 2012 by nnderby. It was filed under EVENTS! and was tagged with Hells Wives, new zealand breast cancer foundation, Northland Nightmares, Northland Nightmares Derby Bratz, Northland Nightmares Roller Girls, Northland Nightmares Roller Girlz, NZBCF, raising money for cancer, Roller Derby, Storm in a D Cup.